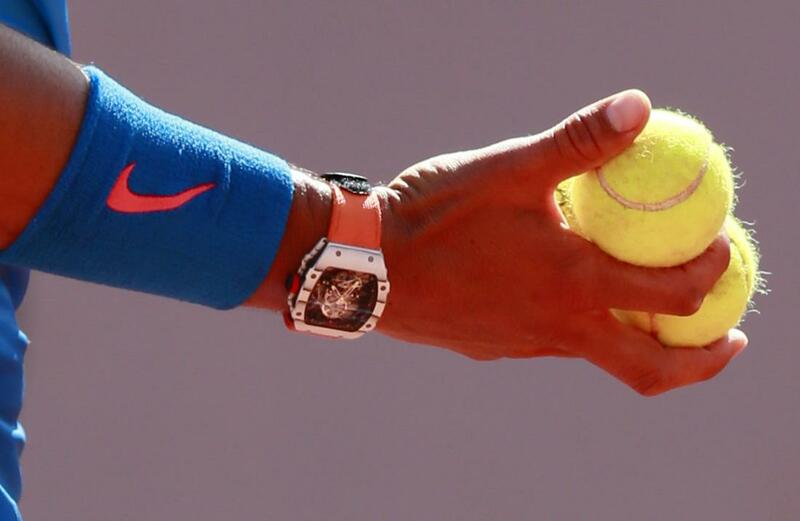 Rafael Nadal is playing in the French Open wearing a $775,000 Velcro watch. Rafael Nadal wears a Velcro watch. Rafael Nadal has played well in the first week of the French Open, advancing to the quarterfinals with a win on Monday over American Jack Sock. As an aside, Nadal’s also played the tournament wearing a $775,000 (Velcro) watch. An athlete wearing a watch during play is a bit unusual; LeBron James slashing to the hoop wearing a Rolex seems slightly terrifying for defenders. But since tennis is a sport where all you can do is hurt yourself with your fancy watch, sure, why not, go ahead and wear a watch. This is the third watch that Richard Mille has custom-made for Nadal. Nadal has had two watches stolen. One, which was taken from a locker room, was never recovered. The other was lifted from his hotel room in 2012, while Nadal was having dinner to celebrate his seventh French Open title. The hotel caught the thief by tracing a magnetic keycard used to enter Nadal’s room. Nadal would have lost a third watch if not for Eric Butorac, a doubles player who picked up a towel in the Cincinnati locker room a few years ago and found Nadal’s watch sitting there on a bench. “I remember holding it and thinking, ‘Wow, this is worth more than my career prize money,’ ” Butorac said. He found Nadal in the training room and returned the watch. Jack Sock will take home just over $150,000 for getting to the final 16 at Roland Garros. In fact, only the finalists will earn enough in Paris to be able to afford Nadal’s watch, which makes swiping it from the locker room looking like a pretty good play.